Gregory, born at Rome about the year 540, was the son of Gordianus, a wealthy senator, who later renounced the world and became one of the seven deacons of Rome. 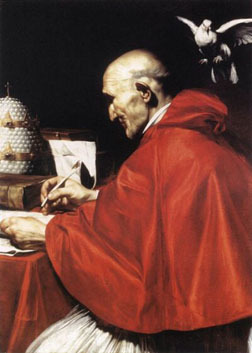 Gregory was appointed Chief Magistrate of Rome. After the death of his father, he built six monasteries in Sicily and founded a seventh in his own house in Rome, which became the Benedictine Monastery of St. Andrew. Where he assumed the monastic habit. After the death of Pelagius, Gregory was chosen Pope. Gregory had strong convictions on missions. He re-energized the Church's missionary work in northern Europe and sent a mission, under Augustine of Canterbury, to evangelize the pagan Anglo-Saxons of England. The mission was successful, and it was from England that missionaries later set out for the Netherlands and Germany. He is known for his contributions to the Liturgy, his writings and is one of the four great Doctors of the Latin Church. He died in 604 and is the patron of teachers.